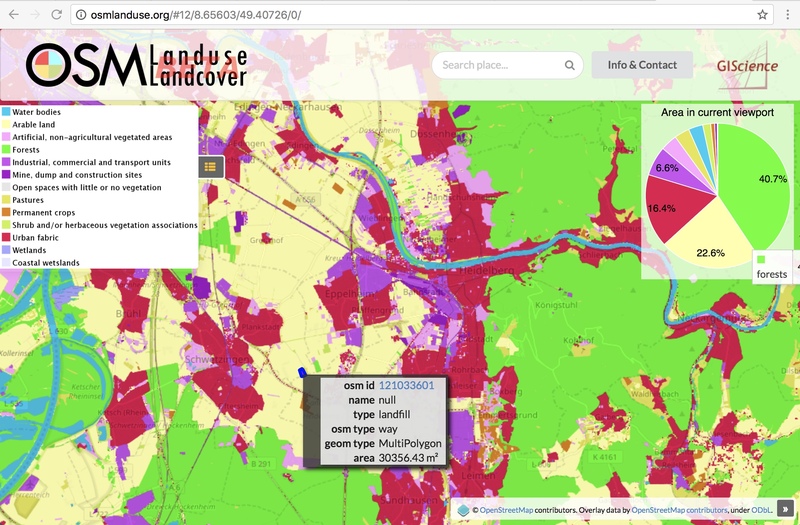 With the aim of rapidly estimating the updated state of the CORINE land-cover map at the frequency with which the OpenStreetMap (OSM) dataset is edited and extended, we propose an approach for automatically associating widely used OSM tags to Level 1 and Level 2 CORINE land-cover classes. This association is probabilistic and is undertaken based on different text and semantic similarity methods. The input to these methods are the tag and class descriptions found on the OSM Wiki and CORINE Nomenclature documents, respectively. Thirty different associations were undertaken based on different text and semantic similarity methods. The methods performances were evaluated based on reference data produced by five land-use/land-cover experts. The best association accuracy achieved for Level 1 (5 classes) was of 90%. However, for Level 2 (15 classes), the best achieved accuracy was of only 62%. In this paper, we also present an approach for potentially improving the CORINE map derived from OSM by letting the tag-class association probabilities from OSM features to be influenced by the probabilities of their neighbouring OSM features. We explain how this may lead to more accurate and spatially smoothed CORINE land-cover maps derived from OSM. Because close geographical entities tend to be similar or related, letting the context, i.e. the class probabilities of the features spatially near a given feature, influence the class probabilities of this given feature may lead to an overall better labelling of the whole scene. In our context, the probabilities are the tag-class associations (which are normalized), and the features are OSM features containing these tags. Formally speaking, we let the CORINE class probability distribution of an OSM feature to be dependent on the tag-class association probabilities of its nearby OSM features. These dependencies can be modelled as a Markov Random Field. This idea will be implemented in the upcoming weeks and discussed in the workshop. Novack, T., J. Voss, M. Schultz, A. Zipf (2018, accepted): Associating OpenStreetMap tags to CORINE land-cover classes using text and semantic similarity measures. VGI-ALIVE Workshop at AGILE 2018. Lund, Sweden. Jokar Arsanjani, J., Mooney, P., Zipf, A., Schauss, A., (2015): Quality assessment of the contributed land use information from OpenStreetMap versus authoritative datasets. In: Jokar Arsanjani, J., Zipf, A., Mooney, P., Helbich, M., OpenStreetMap in GIScience: experiences, research, applications. ISBN:978-3-319-14279-1, PP. 37-58, Springer.